A community boatshop in Portland,OR. Spearheading development of a Willamette Ferry system, based on the historic Crater Lake tour launches. Boat building classes and educational programs. Sponsors the Portland Wooden Boat Show. RiversWest is a non-profit membership organization in Portland, Oregon, for people who love hand crafted boats. The mission of RiversWest,Inc. is to encourage the personal involvement in the building, recreational use and history of low-impact boats. 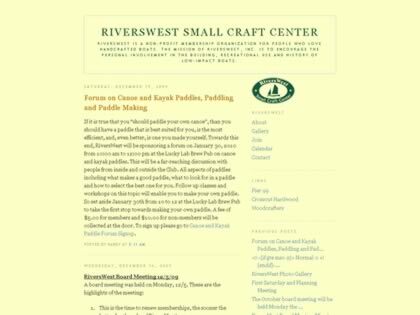 Web Site Snapshot: If available, above is a snapshot of the RiversWest web site at http://www.riverswest.org as it appeared when this site was added to the directory or last verified. Please Note that Boat Design Net has no involvement with the above web site; all content and images depicted in the above thumbnail are the property and copyright of RiversWest unless otherwise noted on that site. Description: A community boatshop in Portland,OR. Spearheading development of a Willamette Ferry system, based on the historic Crater Lake tour launches. Boat building classes and educational programs. Sponsors the Portland Wooden Boat Show. RiversWest is a non-profit membership organization in Portland, Oregon, for people who love hand crafted boats. The mission of RiversWest,Inc. is to encourage the personal involvement in the building, recreational use and history of low-impact boats.